The Caledonia, a very large residential development of The Related Companies, L.P., and Taconic Investment Partners L.L.C., on the east side of Tenth Avenue between 16th and 17th Streets apparently took much of its interior design inspiration from the craggy, winding, quixotic and sometimes organic Chelsea Market directly across from it on 16th Street. 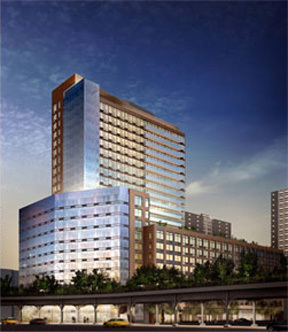 The 24-story project includes 190 condominium apartments in its tower and 288 rental apartments in its 8-story-high wing. Occupancy was scheduled for fall 2008. While its architecture fails to rise to the stararchitect status of some of its contemporary buildings in Chelsea, it abounds in amenities. The building was designed by Handel Architects LLC., with "enlightened design" by Clodagh. The through-block lobby, it maintained, "was conceived as a necklace of experiences inspired by Clodagh's global travels and the local neighborhood," adding that "The patina of metal and steel contrasted with the rich grain of wood and light creates shadow and reflection throughout." The lobby has "walls of flamed and coarsely finished sandstone and Venetian plaster, horizontal bands of grouted amber pebbles, blue stone flooring....cascading water flows into a stone reflecting pool, a floating bridge over the water trough leads from the parking garage into the lobby, elevator cabs feature Osetra suede and metal panel walls, mirrors with metal mesh layering, and blue stone flooring,...illuminated bamboo garden through overhead skylight." The lobby also has a concierge desk, "inspired by Richard Serra," and "fashioned from a solid walnut slab atop a corten steel base, lit by a kinetic, pulsating light sculpture." "Raised in Oscar Wilde's Irish summer home, Clodagh's passion for literature inspired her to create a residential browsing library" that has a graphite cement stone fireplace and a "custom anodized iron bamboo privacy screen" that is not far from a bamboo garden designed by H. M. White. Apartments have bamboo plank flooring, and kitchens have Miele dishwashers and SubZero refrigerators, both with "integrated bamboo panels." Bathrooms have "Golden Sand" tile flooring and quartztite tiled walls, "thick ginger crystal polished quartztite slab countertops" and "Artic white Corian vessel sinks" as well as custom design fixtures by Watermark "inspired by ancient Etruscan metals," and Toto Carolina one-piece toilets. The building has an Equinox fitness center with a kid's club, a sundeck, a business center, a pet spa, a children's playroom, bicycle storage, storage bins, 24-hour doormen and concierges, and an residents' entertainment lounge with "woven grasscloth wall covering with woven window shades." The building includes 59 "permanent," "affordable" rental apartments. The condo and rental sections of the building share a common lobby, but have separate elevators. The building has provided $28 million to the High Line park for public access to the elevated park from its site. Prices for the 190 condominium apartments initially ranged from $595,000 for a studio to more than $4 million for a penthouse. The Related/Taconic project is on the former site of the Chelsea Garden Center and close to another large project planned by Edison Properties LLC and designed by Robert A. M. Stern Architects that will include 869 condominium apartments in two towers at 501 West 17th Street.